Videos, examples, and solutions to help Grade 8 students understand that a two-dimensional figure is congruent to another if the second can be obtained from the first by a sequence of rotations, reflections, and translations; given two congruent figures, describe a sequence that exhibits the congruence between them. I can apply the concept of congruency to write congruent statements. I can reason that a 2-D figure is congruent to another if the second can be obtained by a sequence of rotation, reflections, and translation. I can describe the sequence of rotations, reflections, translations that exhibits the congruence between 2-D figures using words. The following table shows examples of congruence and transformation of figures: translation, rotation, and reflection. Scroll down the page for more examples and solutions. Two figures are congruent if you can translate, rotate, and/or reflect one shape to get the other. Using congruence transformations, including translation, reflection, and rotation. 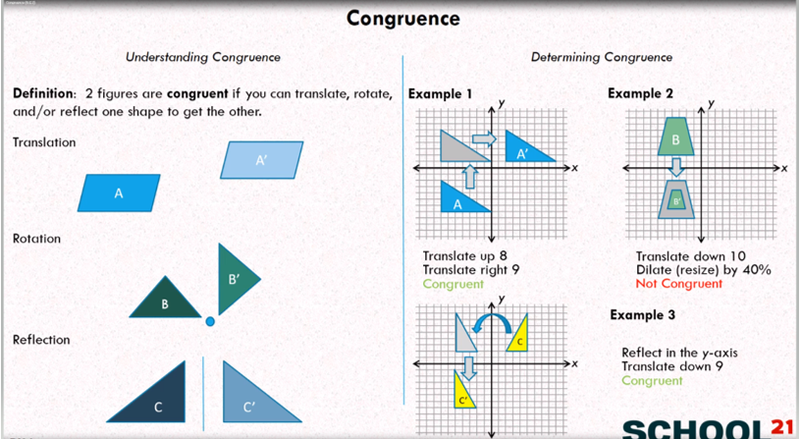 This video demonstrates congruence using transformations.